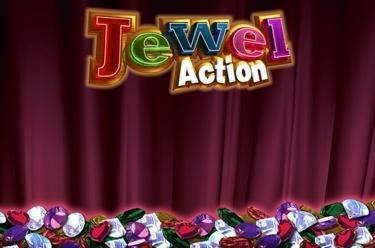 Play Jewel Action online for free now! Fancy a different slot? Then you’re in the right place! No reels are spinning at Jewel Action, instead it rains diamonds and Twists! Let the sparkling gems fall into 3 rows and look forward to horizontal, diagonal AND vertical running winning combos! 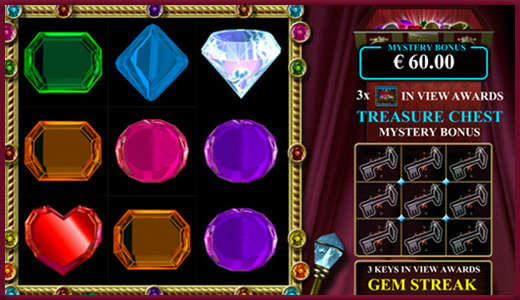 Thanks to the Reel Refill-Principle this slot churns out winnings and additional Bonus Features give it an extra kick! Jewel Action is played in 3 rows with 9 positions that run across 10 win lines. Arrange at least 3 matching symbols side by side on a line to win. The winning patterns run horizontally as well as vertically. To win, the symbols must lie next to each other without any other symbols between them. The WILD symbol (Joker) substitutes all other symbols except the Treasure Chest, the Jester's Hat and the Key. Land 3 or more Key symbols in one spin to trigger the Gem Streak Feature. The 9 positions are repeatedly filled with random sets of identical symbols. The symbols increase in value up to one main win after the other, as long as luck is on your side! 3 treasuere chests activate the Mystery Bonus. This varies and with a bit of luck can multiply your bet by up to 500 times! With the King Chance Game the Kings are winning symbols, promising high winnings! Land 9 Kings to hit the Jackpot. The Jester's Hat will swap out all symbols on the reels for new ones and counts towards the win of the new symbols and the old symbols which were swapped out.